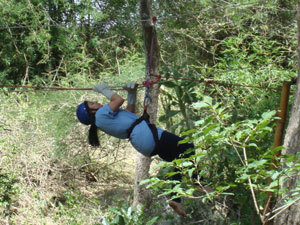 Our camps are located in pristine wilderness areas across the mountains. 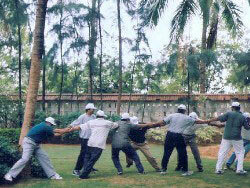 The cool air, distant from place of work are ideal for conduct of outdoor programmes. 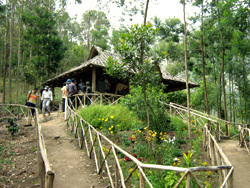 The primary location of all our training programmes is located at a scenic location near Munnar in Kerala. It is about 4 � hrs drive from Cochin (nearest Airport) and is at an altitude of about 6000 feet in a lush green environment surrounded by hills, tea gardens and overlooking the Anaerangal Lake. The environment is clean and pure and with cool, comfortable climate. 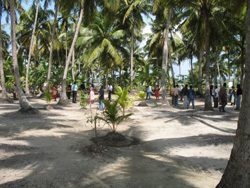 The camp has been set up with paramount importance to safety and hygiene. 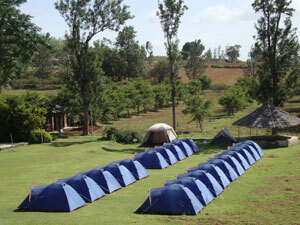 Tented accommodation is available for 40 participants at a time. Clean and well maintained bathrooms, separate for ladies and gents, are provided. Mineral water is available for drinking and delicious vegetarian & non vegetarian food is provided. 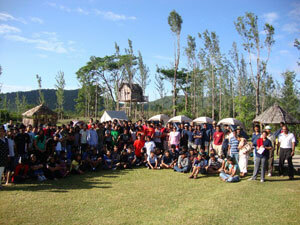 We also conduct our programmes at Kulamavu, near the Idukki Lake. This resort-based programme is available to those who desire to stay within the comfort of resorts. 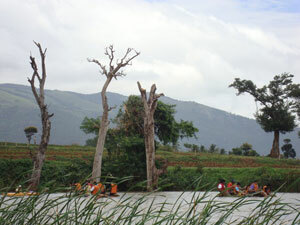 The salubrious air at Kulamavu amidst the rugged hills is an ideal location too. For those looking for locations near cities, but with a touch of wilderness, we have our programmes at the lowland forests at Thattekkad, at the exclusive Hornbill Camp. 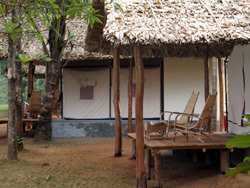 The camp situated on the banks of the river Periyar is ideal getaway and a quiet destination away from Cochin. 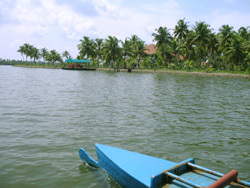 An island near Kumbalangi, the model village near Cochin, is both away from the bustle of the city as well as connected well. The quiet ambience of the village is ideal for conduct of the learning course. Unspoilt and untouched by mass tourism and where time acquires new meaning! 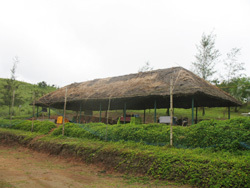 The Farm is a unique concept that blends active farming, with eco-holidaying, nature learning, and outbound corporate training!Spread over 100 acres of broken landscape, this picturesque Farm will, guaranteed force you to shed all your cares and worries and soak in the rejuvenating glory of nature at its best. 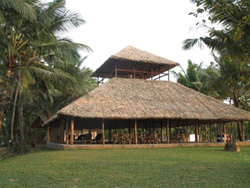 The Farm itself is surrounded on three sides by the reserve tropical forests of the enchanting Western Ghats and bordered by a jungle stream with a small waterfall as well. 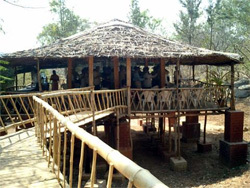 Visitors have seen and heard wildlife (tigers and elephants to wild boar and deer) - an exhilarating experience & a perfect place for your corporate executives! 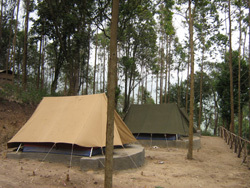 The camp is 2 hours from either Coimbatore or Mysore. 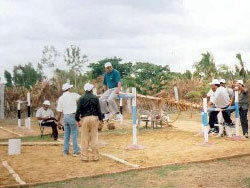 We conduct this programme based around 2 locations on the outskirts of Bangalore. 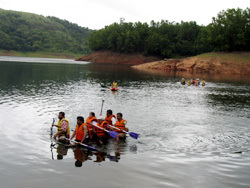 Wonder Valley: A secluded camp about 24 kms from Bangalore, located adjacent to the Bannarghatta National Park. 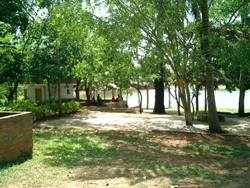 Emerald Isle: This is a 6 acre holiday resort set amidst coconut palms and located 27 Kms from Bangalore on the Kolar/Chennai Road.